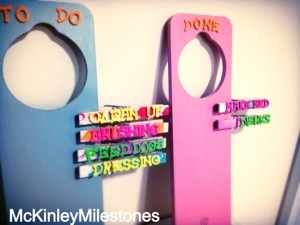 I was looking for a cute way for McKinley to have a visual aid of her chores, and be excited about doing them. (Yes, my 21-month-old helps with chores). Best little helper ever!! Teaching responsibility and allowing toddlers and kids to do things on their own can actually reduce the amount they “act out”, or throw tantrums. They simply enjoy the independence! 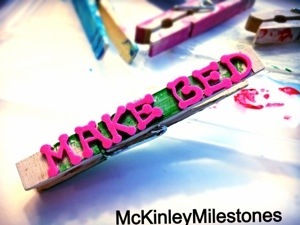 This also acts as a great craft activity for the kiddos! 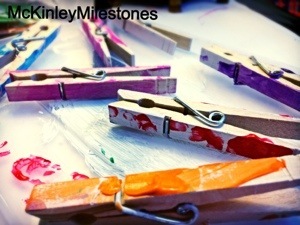 McKinley had a blast finger painting the clothespins! 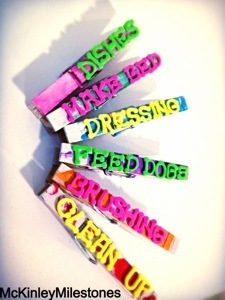 Since then, everyday she has been excited to do chores (so she can move a clothespin!) 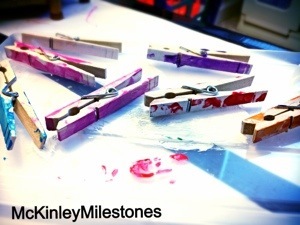 I’ve realized too, that the moving of the clothespin is an awesome activity for gross motor skills. Next Post Do you have a crazy family?